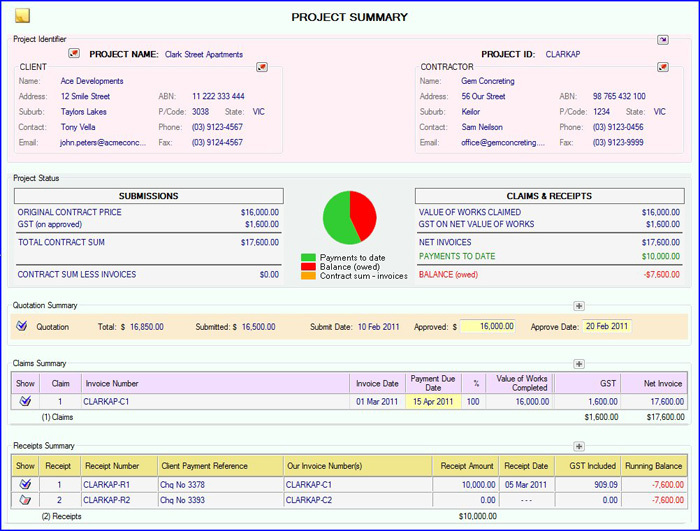 ProjectPal is a specialized software application that greatly simplifies the process of creating, managing and tracking of quotes, tenders, variations, progress claims/invoices and receipts for any business running projects that span from several hours to several months. It automates many processes for ease of use with sufficient flexibility and minimal user input to accurately produce professional looking documents that can be printed and faxed or automatically sent to clients as email (PDF) attachments. 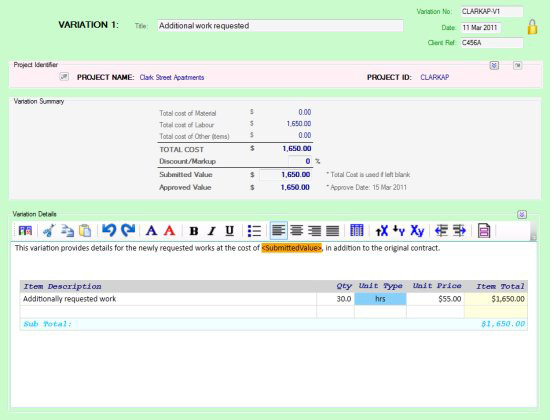 ProjectPal-Basic caters for smaller operators that focus mainly on jobs taking up to several days to complete. They generally involve a quotation, 1 progress claim/invoice and up to 2 receipts. 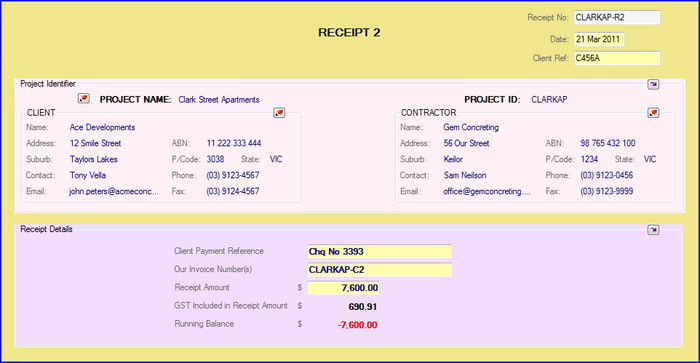 ProjectPal-Basic is a specialized software application that greatly simplifies the process of creating, managing and tracking of quotes, progress claims/invoices and receipts. It is well suited for smaller operators that focus mainly on jobs taking up to several days to complete. They generally involve a quotation, 1 progress claim/invoice and up to 2 receipts per job. This program automates many processes for ease of use with sufficient flexibility and minimal user input to accurately produce professional looking documents that can be printed and faxed or automatically sent to clients as email (PDF) attachments. 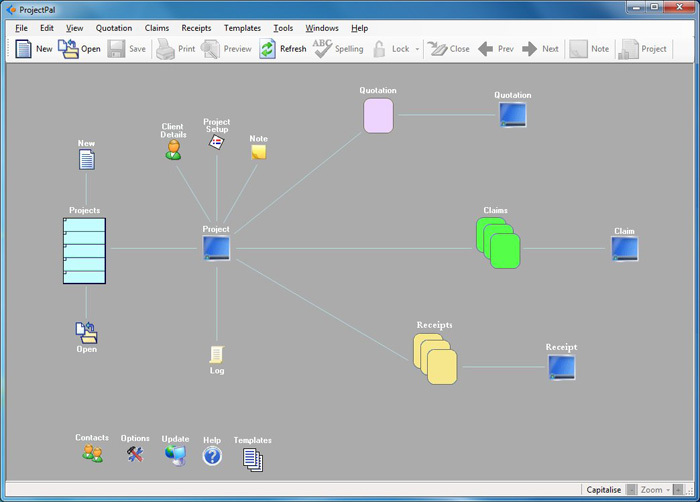 This window graphically shows all the documents included within a project. 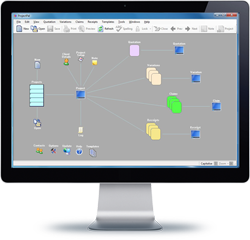 It is used to create new or load existing projects, access all documents (including templates) and modify system options. 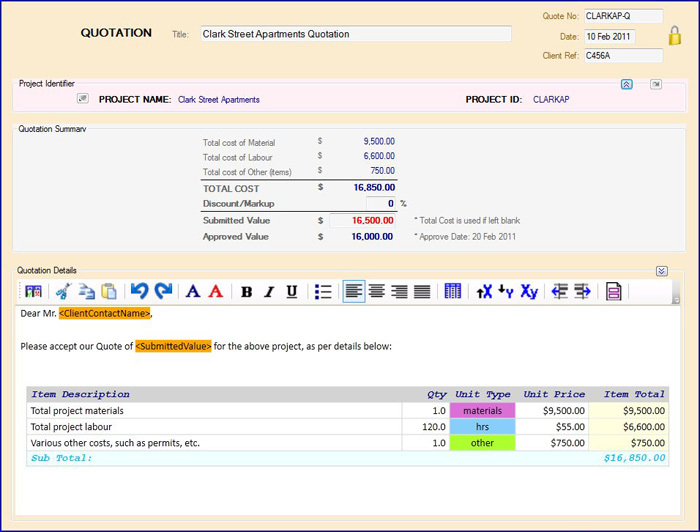 This window shows an up-to-date summary of a project that includes project identifier, client details, numeric and graphical project status and summary of individual Quotation, Claim and Receipt details. This window lets you enter tender details such as material and labour costs and any level of information you wish to include. 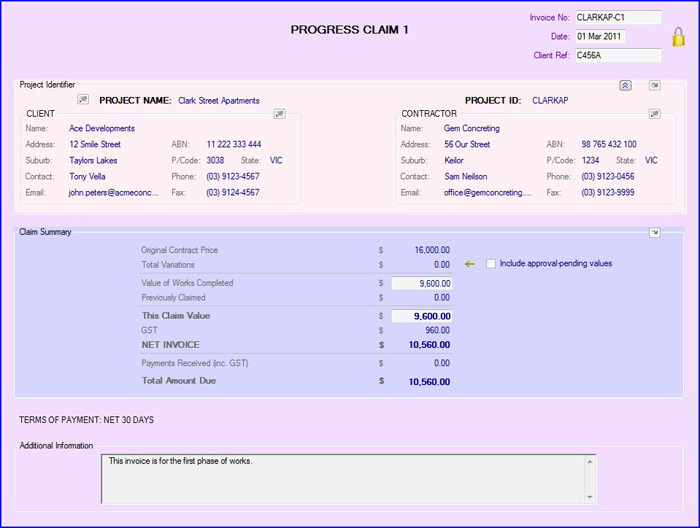 This window lets you create progress claims/invoices for works completed on a project and includes project identifier, client details, claim summary and any additional information/notes (for the client). This window lets you create receipts for payment(s) received and includes project identifier, client details and receipt summary. ProjectPal-Standard caters for smaller to medium operators that focus mainly on jobs taking up to several weeks to complete. They generally involve a quotation or tender, up to 2 variations, 3 progress claims/invoices and 5 receipts. 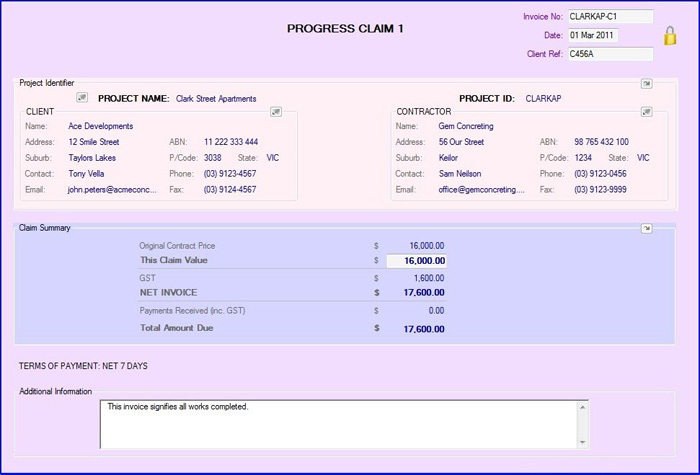 ProjectPal-Standard is a specialized software application that greatly simplifies the process of creating, managing and tracking of quotes, tenders, variations, progress claims/invoices and receipts for any business running projects that span up to several weeks to complete. They generally involve a quotation or tender, up to 2 variations, 3 progress claim/invoice and 5 receipts per job. The following images represent some of the main ProjectPal-Standard windows. 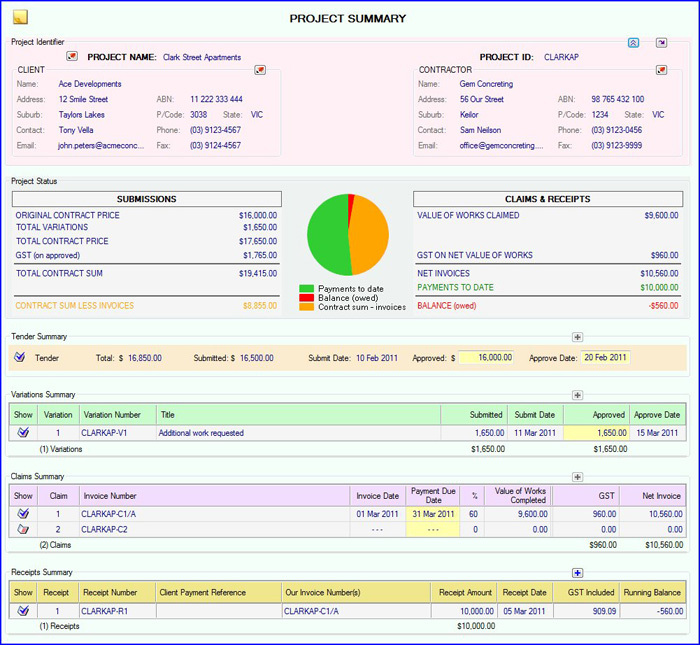 This window shows an up-to-date summary of a project that includes project identifier, client details, numeric and graphical project status and summary of individual Tender/Contract, Variation, Claim and Receipt details. 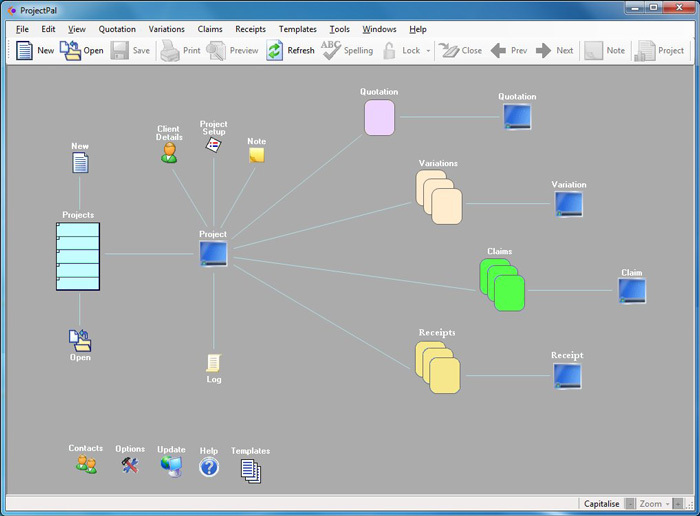 This window lets you enter variation details such as material and labour costs and any level of information you wish to include. This window lets you create receipts for payment(s) received and includes project identifier, client details, receipt summary and receipts history. Fill in the form below to request technical support for ProjectPal. All purchases are processed immediately and license details delivered by e-mail.